The Premier Lecture (London) is a significant occasion in our annual calendar and is delivered by prestigious and well know speakers from the Christian arena. Speakers in the past have included Lord Paul Boateng, Professor John Lennox, Os Guinness, The Bishop of London, Dr Jane Williams and more recently Alistair McGrath. The Premier Lecture is delivered and recorded for broadcast in front of a live audience specially invited at or around Premier Anniversary’s date. If you would like to be invited for future Premier Lecture events, please click here and fill in the form and we will contact you in due course. Graham Tomlin is a British theologian, author and Church of England bishop. Since September 2015, he has been Bishop of Kensington, an area bishop in the Diocese of London. From 2007 until 2015, he was Dean then Principal of St Mellitus College. Bishop Tomlin was ordained in the Church of England as a deacon in 1986 and as a priest in 1987. He was curate of a church in Exeter before returning to Oxford to be chaplain (1989–1994) of Jesus College and a tutor in historical theology and evangelism at Wycliffe Hall, where he eventually became the vice-principal. As the Bishop of Kensington, Bishop Tomlin experienced the terrible Grenfell Tragedy first-hand and gave a Christian perspective on how to rebuild community in the aftermath of tragedies like Grenfell. Dr Williams studied theology at Clare College in Cambridge and then worked in theological publishing and education. For three years she wrote a Sunday readings column for the Church Times, and is a visiting lecturer at King's College London. She is assistant Dean and lecturer at St Mellitus College (formerly St Paul's Theological Centre) in London. Dr Williams has been married since July 1981 to Rowan Williams, who was appointed as the 104th Archbishop of Canterbury in 2002. Dr. Williams encouraged us to think about how our Christian walk and how we engage with the society around us in a lecture entitled, 'Living as a first century Christian in twenty-first century Britain'. Do you sometimes feel like you need to be encouraged in your faith, especially with the challenges you face in an increasingly secular culture? Well, it was our birthday on 10th June, and as part of our celebrations, we held the 4th annual Premier Lecture. The speaker was respected apologist and Professor of Mathematics at the University of Oxford, John Lennox, speaking on "Against the Flow” – and using the book of Daniel. Premier is presenting the third annual Premier Lecture with the Rt. Hon Lord (Paul) Boateng on Tuesday 10th June. An interview with Lord Boateng will be broadcast on Premier Christian Radio on Sunday 15th June at 9pm. Rt. Hon Lord (Paul) Boateng was the Chief Secretary to the Treasury in Tony Blair’s Cabinet from 2002. Born in Ghana, he came to Britain at the age of 15 when his father was imprisoned without a trial after the coup d'Etat that overthrew the government of Kwame Nkrumah. He trained as a solicitor and was elected to Parliament in1987 as MP for Brent South. In 2005 he was made British High Commissioner to South Africa and in 2010 appointed to the House of Lords as Lord Boateng of Akyem and Wembley. 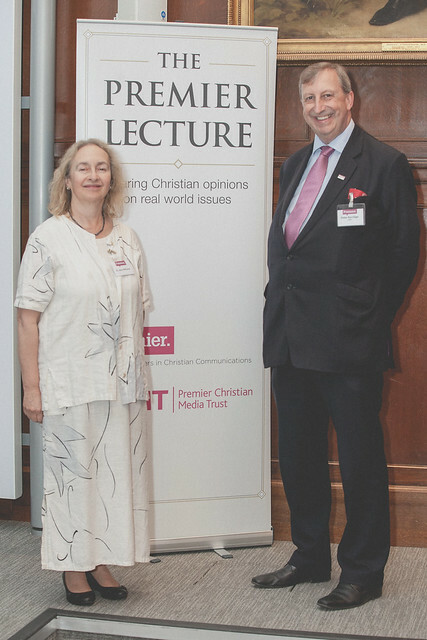 Premier Christian Media Trust presented the second annual Premier Lecture with the Bishop of London, the Rt. Reverend and Rt. Honourable Richard Chartres KCVO DD FSA at a prestigious London venue on 10th June. The vision of building a society that welcomes Jesus has inspired generations of Christians. An increasingly secular Britain has no such vision and the Bible tells us that where there is no vision people perish. Bishop Chartres will explore what can be done to transform the nation and London in particular, as Christians and churches live out their faith and relationship with Jesus in every sphere of life in preparation for His return. People throughout the world are to be invited to sign-up to and support a ‘Global Charter of Conscience’ in an international campaign to guarantee freedom of thought and religion for all. Author and social critic Dr. Os Guinness, who hopes to persuade world leaders to reaffirm their support for Article 18 of the Universal Declaration of Human Rights, presented the details of a ‘Global Charter of Conscience’ in a radio lecture, on June 28th, commissioned by Premier Christian Media Trust. It was the prelude to the launch of a new campaign website - www.declarationforfreedom.org, where everyone can learn more about, and sign-up to, the Charter. Anyone visiting the site from the UK will find a facility which will enable them to write to their local Member of Parliament asking them to support the campaign. Premier Christian Media will also be approaching the Commons and Lords, Christian church leaders, and leaders of other faiths. World leaders will also receive from Premier the ‘Global Charter of Conscience’ as a key element of the campaign. ‘The Premier Lecture’ - ‘Soul Freedom; Living with our deepest differences in an age of expanding diversity’ - will be the first in a planned series of annual radio lectures by Premier, featuring an acknowledged expert in their field. Guinness, a Senior Fellow of the East West Institute in New York and co-founder of the Trinity Forum, seeks to persuade the United Nations to recognise his ‘Global Charter of Conscience’ as an adjunct to the Universal Declaration of Human Rights. He also plans to highlight the inadequacy of the Equality Act  and how it fails to address tensions between different strands of equality policy. For more information on ‘Declaration for Freedom’, log on to the website.